As claimed by Sangoma it is “industry’s first affordable single span T1/E1/J1 board with available Telco-grade hardware echo cancellation — designed for optimum voice support for smaller systems“ for smaller systems. 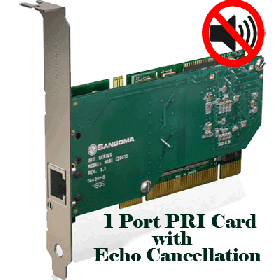 Sangoma 1 port PRI digital card uses the same high-performance PCI or PCI Express interface that is providing superior performance in critical systems all over the world. It supports up to 2.048 Mbps of full duplex data throughput or up to 30 voice calls over a single T1, E1, or J1 line.